SAMAIN, Albert. Le chariot d'or. Librarie des Amateurs, A. Ferroud - F. Ferroud, Successeur. 1907. Limited edition of 250 copies, of which this is number 230. 146pp. 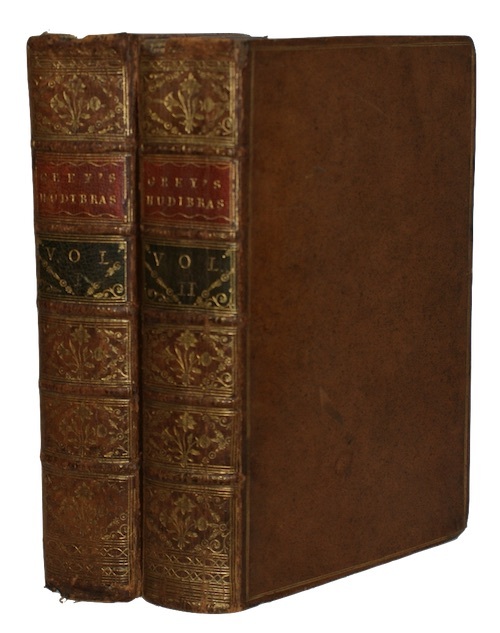 With a half-title, an engraved frontispiece, and several engraved vignettes by Charles Chessa. 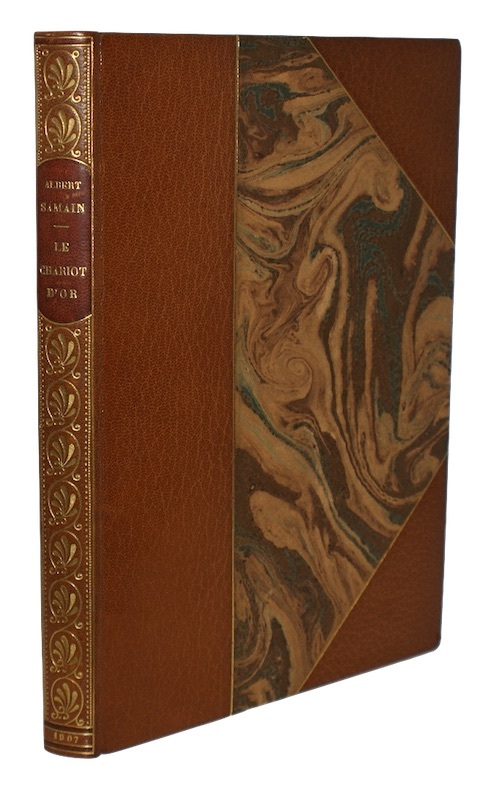 Attractively bound by P. Affolter in contemporary gilt-tooled tan crushed morocco, marbled boards, T.E.G. Very slight shelf-wear to extremities. Marbled endpapers, very occasional light spotting. [EDINBURGH]. An historical sketch of the municipal constitution of the city of edinburgh; including the set of the burgh as established in 1583, and amended in 1730; with the acts of parliament and council relating thereto...To which is added, an historical account of the blue blanket, or the craftsmen's banner; containing the fundamental principles of the good town. - By alex. pennecuik. John Anderson et al.. 1826. First edition. lxxx, , 178pp. With an engraved frontispiece, eight engraved plates depicting the arms of the Edinburgh corporations, and 11 tables/lists (nine of which folding). 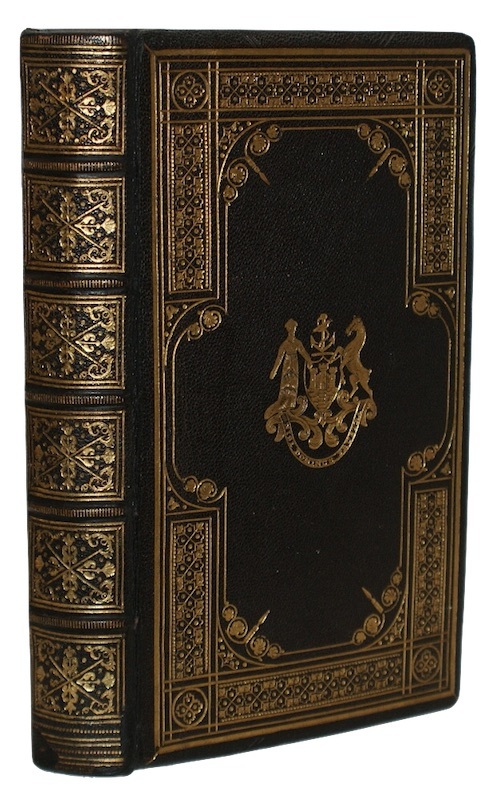 Handsomely bound in near contemporary richly gilt-tooled black morocco, gilt armorial devices of the City of Edinburgh to boards, later expertly rebacked to style with contemporary spine panel laid-on, A.E.G. A trifle rubbed. Near contemporary inked ownership inscription to head of title, else internally clean and crisp. [GOLDSMITH, Oliver]. The life of richard nash, Esq; late Master of the Ceremonies at Bath. Extracted principally from His original papers. Printed for J. Newbery et al.. 1762. Second edition. viii, 237pp, . With an engraved portrait frontispiece and a terminal publisher's advertisement leaf. Nineteenth-century half-calf, marbled boards, gilt. A trifle rubbed. Early twentieth-century inked inscription to recto of FFEP, inked annotation to head of title-page, slight loss to foot of B1, foxed. BUTLER, Samuel. Hudibras, in three parts; Written in the Time of the late wars: Corrected and Amended. With large annotations, and a preface, by zachary grey, LL.D. Printed for C. Hitch et al.. 1764. Second edition. In two volumes. , xiv, xxxvi, 424, ; , 446pp, . With an engraved portrait frontispiece to Vol. I, and a further 16 engraved plates. 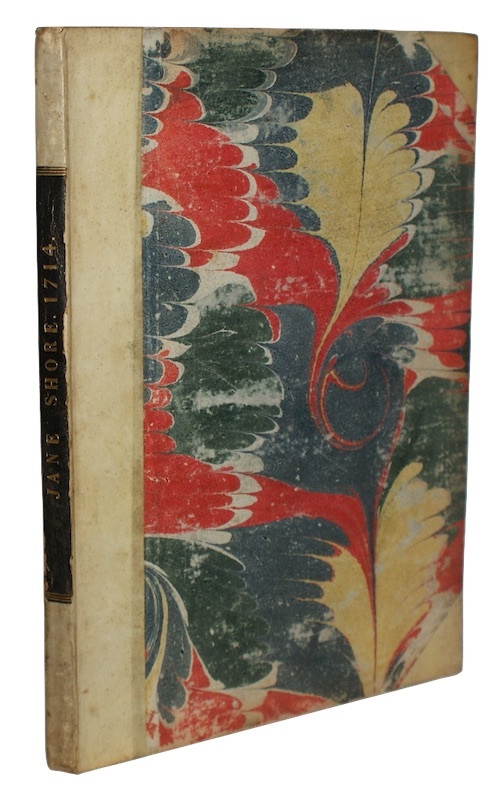 Handsomely bound in contemporary gilt-tooled speckled calf, contrasting red and green morocco lettering-pieces. Extremities rubbed, slight loss to head and foot of both spines. Contemporary armorial bookplates of T. Preston to both FEPs, loss to blank RFEP of Vol. II, very occasional light spotting. 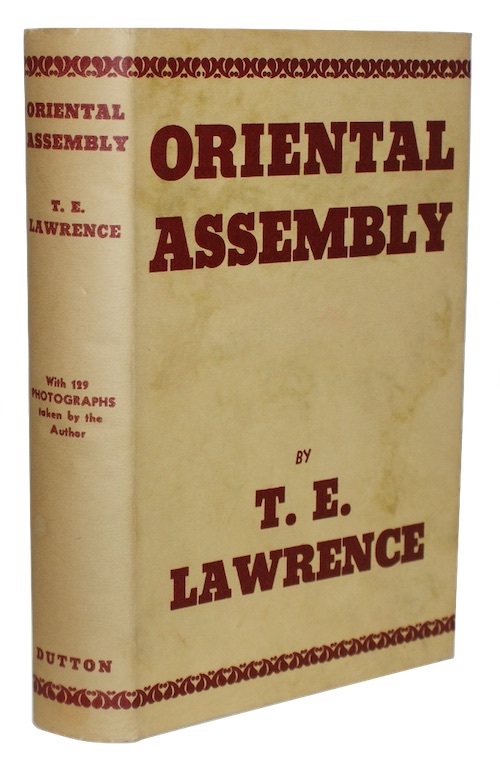 LAWRENCE, T. E.. Oriental assembly. E. P. Dutton & Co. Inc.. 1940. First American edition. xii, , 291pp, . With a half-title. Profusely illustrated with monochrome photographs by the author (many previously unpublished), facsimiles of pages of the author's diary, and a line-drawn map. 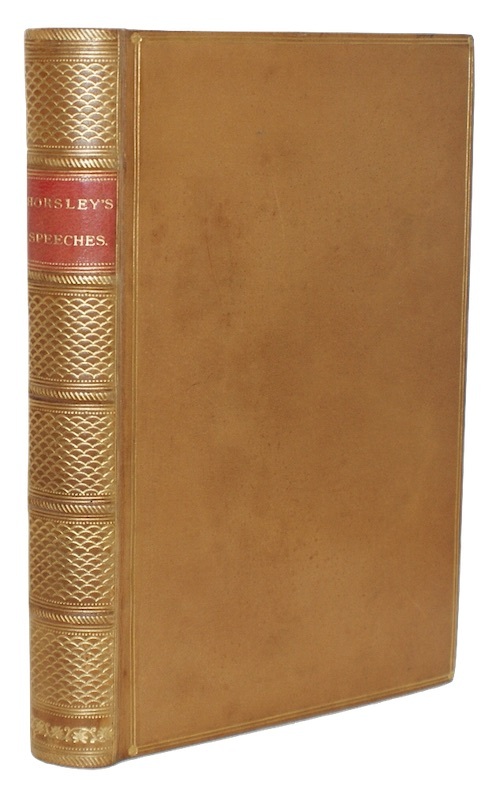 Original publisher's red buckram, lettered in gilt, dustwrapper. Dustwrapper a trifle discoloured. Internally immaculate. A near fine copy. HORSLEY, Samuel. The speeches in parliament of samuel horsley, LL. D. F.R.S. F.A.S. late lord bishop of st asaph. Printed by Robert Stephen Rintoul. 1813. First edition. , iv, ii, 544pp. With a half-title. 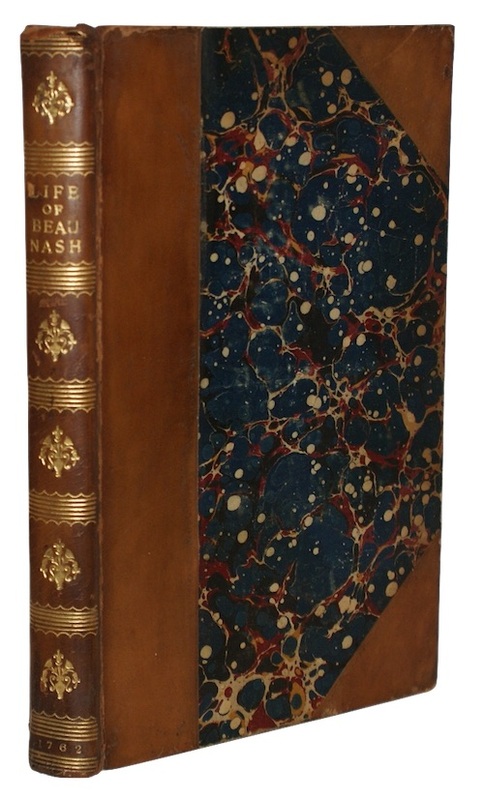 Handsomely bound in gilt-tooled polished calf, contrasting red morocco lettering-piece, T.E.G. Slightest of rubbing to extremities. Marbled endpapers, later armorial bookplate of the Earl of Portsmouth to FEP, later inked ownership inscription of same to blank verso of FFEP, small hole to margin of leaf N8, paper repair to lower corner of leaf 2H5 - not touching text, lightly foxed. [BROOME, Ralph]. Letters from simkin the second to his brother simon, in wales; dedicated without permission, to the ancient and respectable family of the grunters. Printed for J. Debrett. 1796. First edition. iv, 28pp. Contemporary half-calf, marbled boards, lettered in gilt. Rubbed, slight splitting to joints. Title-page a trifle marked, very occasional spotting. [PITT, William - Satire]. Mustapha's Adoration of the sublime sultan Pottander Omnipotent. Part I [-III, entitled Mustapha's Vision]. Printed for G. Riebau. .
Three single leaf broadsides. Creased, with central horizontal folds, occasional light marking and marginal dog-earring, with two small holes (to blank areas) of the first part. [PITT, William - Satire]. Pittpache's Requisition!? Proclamation Extraordinary? Given at our Court of. Printed for and Sold by J. Bullock, Price One Penny. . Single leaf broadside. Creased, some tears repaired to verso, the first letter of the headline shaved, a little marked. ROOKE, Hayman. PEGGE, Samuel. A narrative of what passed at the revolution house, at whittington, county of derby, in the year 1688. With a perspective view, and plan of that cottage. Printed by Samuel Tupman. . First edition. 11pp, . With an engraved view and floorplan of 'The Revolution House at Whittington near Chesterfield, Derby-shire'. 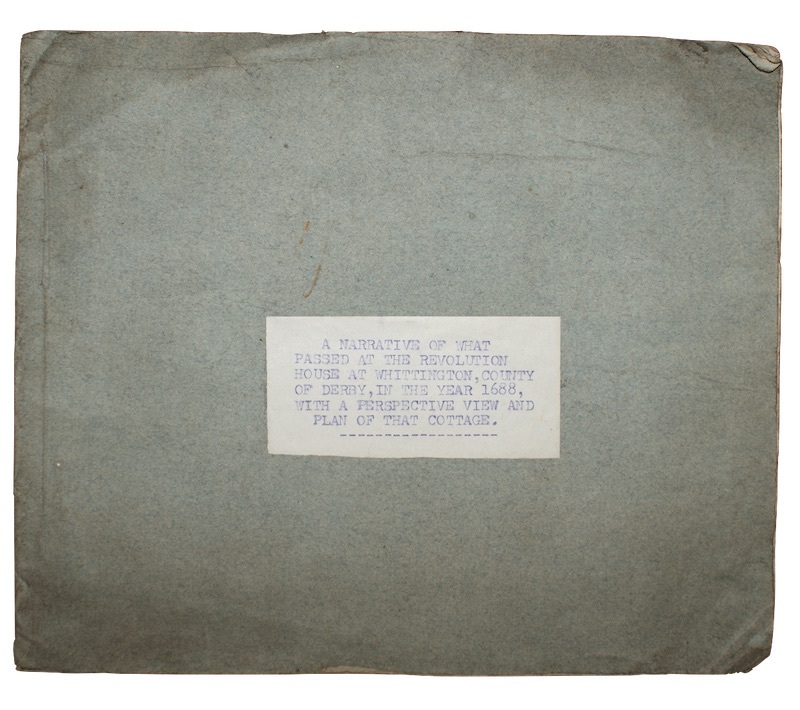 Stitched within original blue paper wrappers, with later typed lettering-piece to upper wrapper. From the recently dispersed library at West Horsley Place, without any evidence of such within the volume. A little creased, some discolouration to text. ROWE, N[icholas]. The tragedy of jane shore. Written in Imitation of Shakespear's Style. Printed for Bernard Lintott. . First edition, first issue. , 63pp, . Without initial leaf (half-title?). 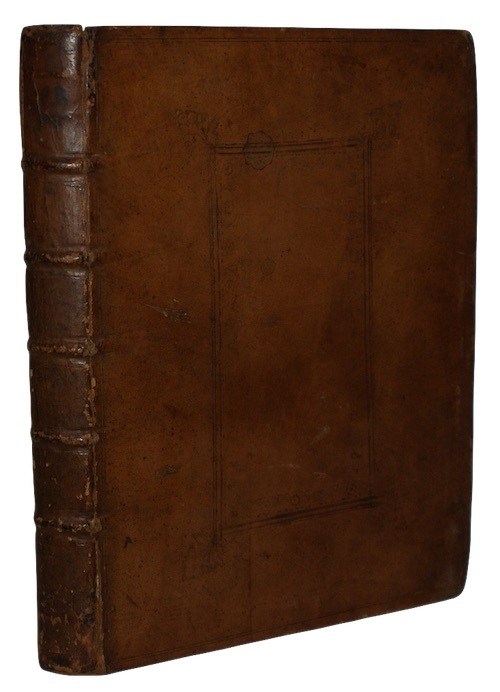 ESTC T55544 [Bound after:] Memoirs of the lives of King Edward IV. And jane shore. London. Printed for E. Curll, 1714. First edition. 28pp. ESTC T139789. Quarto. Nineteenth-century half-vellum, marbled boards, contrasting black morocco lettering-piece. Lightly rubbed and a little marked, slight chipping to lettering-piece. Pen-trials to title and final page of first mentioned work, terminal leaf of same mounted on stub - loss to gutter, with some loss of text to advertisements only, some browning and marking. [CLYDESDALE BANKING COMPANY]. 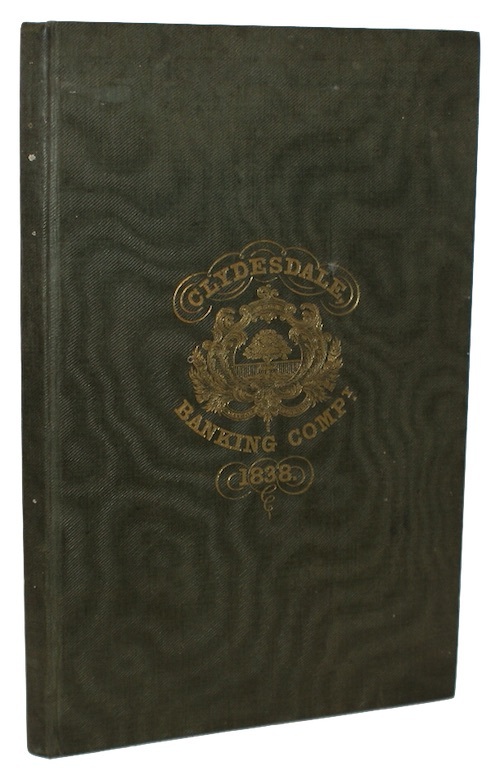 Contract of copartnery of the clydesdale banking company. James Lumsden and Son. 1838. First edition. 70pp. 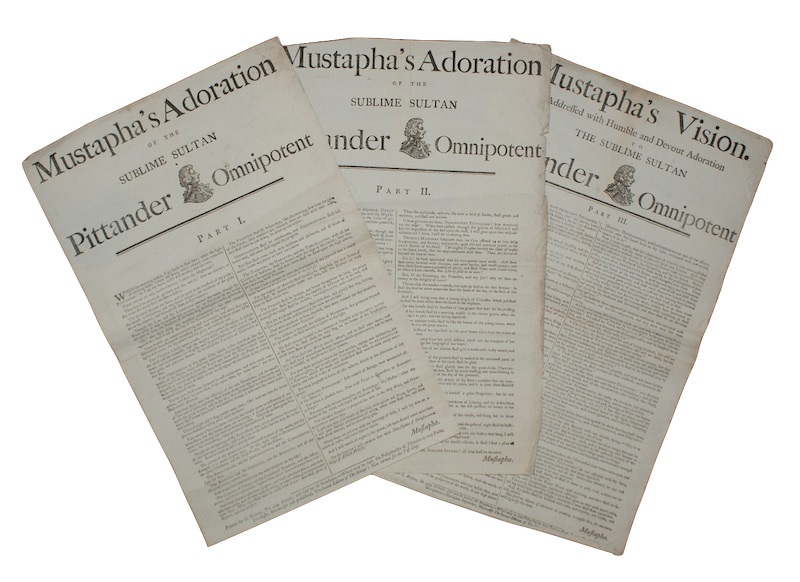 Original publisher's green moire cloth, lettered in gilt, A.E.G. A trifle rubbed. Occasional pen and ink underling. [SYDNEY HARBOUR TRUST]. The port of sydney N.S.W. official handbook. Published by the Sydney Harbour Trust. 1913. Second edition. 68pp. With three illustrated colour maps, three folding monochrome photographic plates, and numerous monochrome photographic illustrations in the text. 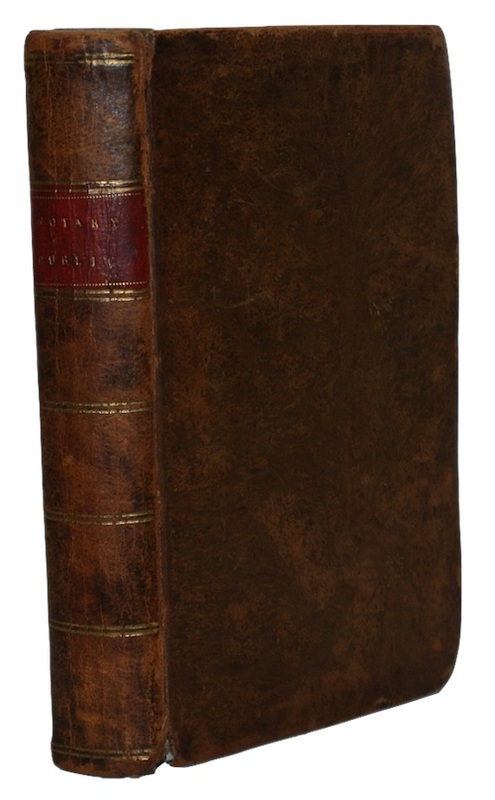 Original publisher's green cloth, stamped in gilt and blind, housed in drab paper slipcase. Extremities rubbed and a trifle discoloured. Text-block working loose of binding, occasional short tears to folding plates/maps, with clear tape repairs to verso of one plate. Compliment slip of the Sydney Harbour Trust Commissioners loosely inserted. SAUMAREZ, Rear-Admiral [Richard]. 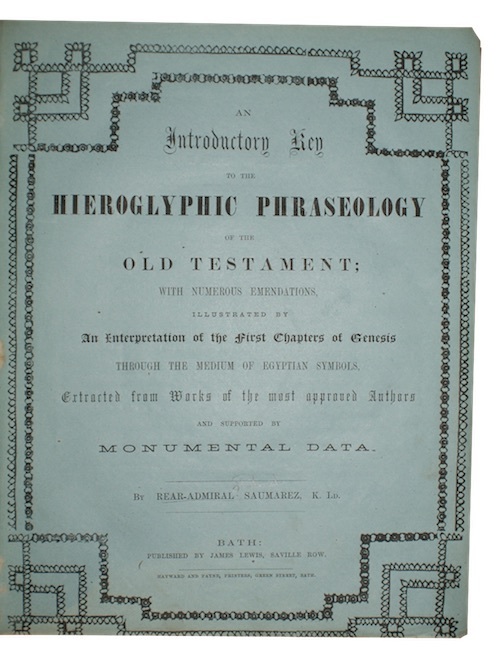 An Introductory Key to the hieroglyphic phraseology of the old testament; with numerous emendations, illustrated by An Interpretation of the First Chapters of Genesis through the medium of egyptian symbols, Extracted from Works of the most approved Authors and supported by monumental data. Published by James Lewis, [s.d., c.1858]. Second edition. vi, 48pp, . Contemporary brown buckram. Rubbed, chipping to spine, a trifle marked and discoloured. Inked ownership inscription and library shelf-marks to FEP, FFEP and Title-page detached, bookplate of the Bath Reference Library to REP.
THOMSON, William. 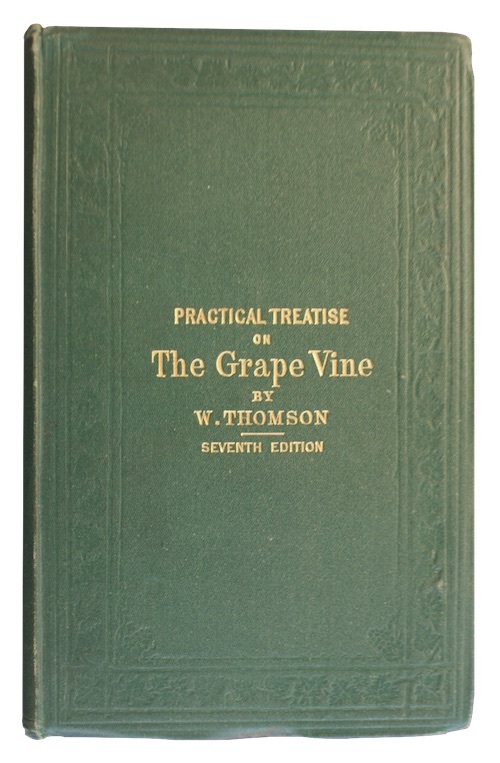 A practical treatise on the cultivation of the grape vine. William Blackwood and Sons. 1871. Seventh edition. , viii, 102pp. With a half-title, an 8pp terminal publisher's advertisement catalogue, and several engraved illustrations in the text. Original publisher's blind-stamped green cloth, lettered in gilt. A trifle rubbed. Internally clean and crisp. SHAKESPEARE, William. The dramatic works of Shakspeare. Allan Bell and Co.. 1837. In seven volumes. Each play has a separate title and pagination. 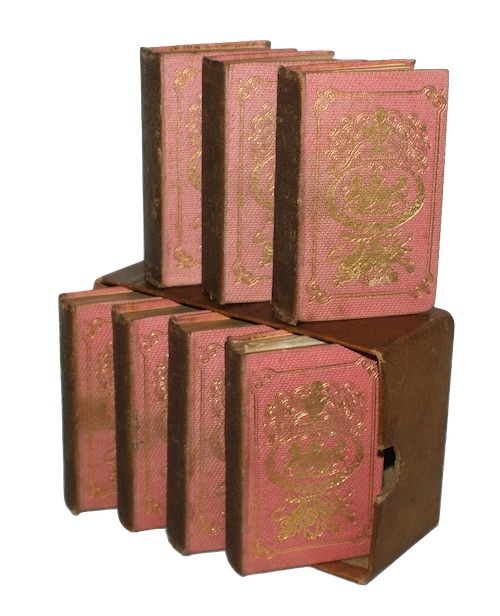 With 31 engraved plates, and numerous engraved vignettes. 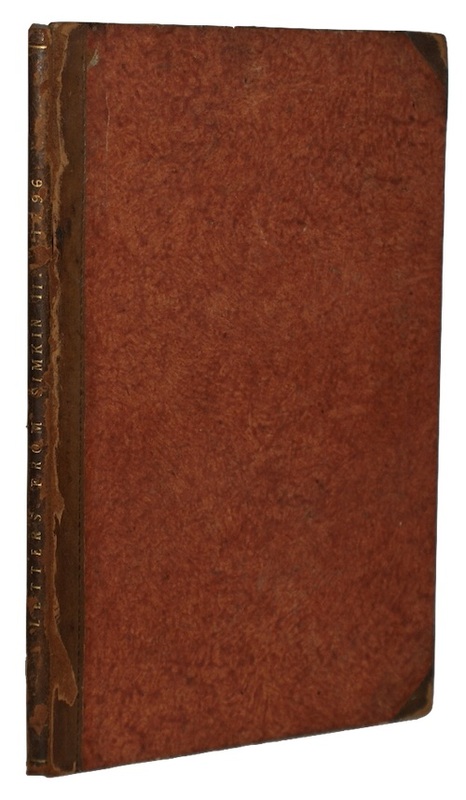 Original publisher's gilt-stamped salmon cloth, A.E.G., housed in original publisher's moire cloth slipcase. Spines sunned and discoloured, lightly rubbed. Internally clean and crisp. ROSSETTI, Dante Gabriel. 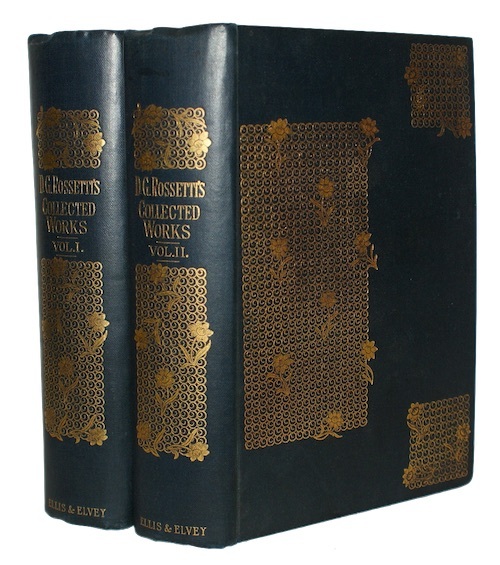 The collected works of dante gabriel rossetti. Ellis and Elvey. 1890. In two volumes. xliii, , 528; xl, 521pp, . With half-titles. Original publisher's gilt-stamped navy cloth. Very slight rubbing to extremities. Decorated endpapers, armorial bookplates of Sir Mervyn Ll. Peel to FEPs, internally clean and crisp. A fine set. [MESTON, William]. The knight of the kirk: or, the Ecclesiastical Adventures of Sir John Presbyter. Printed for M. Smith. 1728. Second edition. , 89pp, . Recent sheep-backed brown cloth, lettered in gilt. Extremities rubbed. Hinges exposed, occasional slight loss to margins, leaves lightly toned, some spotting. [NOTARY PUBLIC]. The office of a notary-public, As the same is practised in scotland... 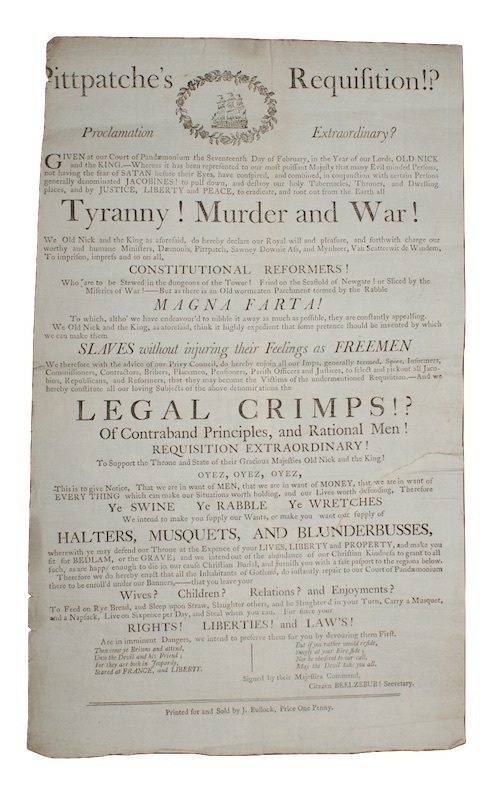 Printed for W. Gordon, J. Dickson, and P. Hill. 1792. Fourth edition. xvi, 391pp, . Contemporary sheep, contrasting red morocco lettering-piece, gilt. Extremities rubbed, some loss to foot of spine. Slight loss to upper corner of leaf Bb4, else internally clean and crisp.